Frederickton Honour Roll commemorates those who served in World War One. Despite the driving rain-squalls of Wednesday night last a large audience assembled at Frederickton School of Arts to witness the unveiling of an Honor Tablet there, and the unveiling of two captured guns. Mr. R. J. Jamieson was chairman, and also present we noted Dr. Page, M.H.R, Cr. Kissane, Rev. C.J. Chambers, Messrs H. H. Bird, J. Leddy, Frank Lawrence, J. M. Edgley, Gillies, N. Cameron, Dryland, Gooud, and others. Mr. R. J. Jamieson, in explaining the object of the gathering, said that erection of the Honor Tablet had been started by Frederickton Football Club, and the School of Arts Committee had then joined in and assisted. Two-thirds of the expense of the tablet had been borne by the Football Club. (Applause). 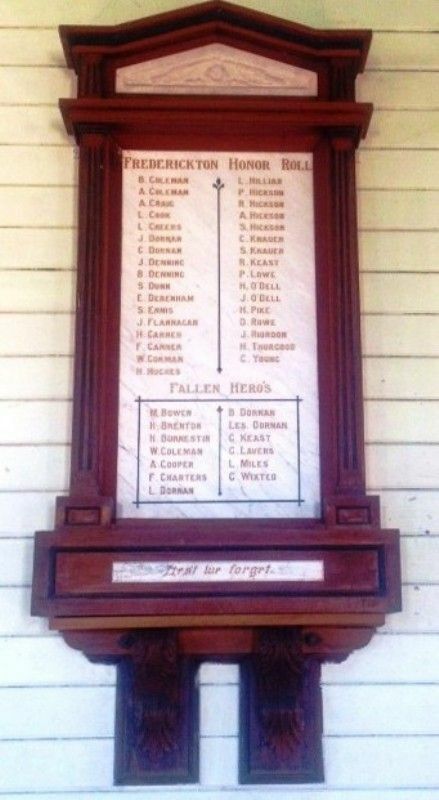 Continuing, Mr. Jamieson said that the tablet was a memorial to the local boys who enlisted and those who fell ; and also to the 60,000 braves who fell on foreign field in defence of their country. After commenting on the initiative and courage of the Australian troops, proven in the Soudan, in South Africa, and finally in the world war, Mr. Jamieson called upon Mrs. Chas. Dornan, as the mother of three soldiers, two of whom fell in action to unveil the Honor Tablet. The Macleay Chronicle (Kempsey, NSW), 31 May 1922.